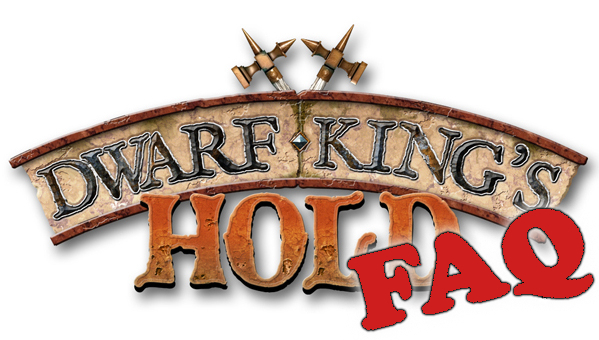 This is the sandpit for me to deal with any rules questions that you might have about any of the games in the Dwarf King’s Hold series. Scenario 4: The Skeleton Hound in the top right quarter of the map should start one square to the left of where it is marked. Scenario 5: Only the Dwarf models in the 6×6 room at the top of the map may use Son of Stone. I have some more questions to deal with, but they need diagrams (which I will do shortly). In the meantime, please ask away if you have a query that hasn’t been covered. Q: Can you attack and count for outnumbering across diagonals you would not be able to move across? A: Diagonals are not blocked for combat either way. It’s much easier to jab a spear or a sword through a small gap than it is to squeeze a whole Dwarf or Orc through. Blocked diagonals are an issue with movement, never for fighting, and have no bearing on outnumbering or anything else. Q: As turning does not cost movement, does a model get to turn to face an enemy before they Break Off and the foe makes a Free Strike (ie, can you avoid the -1 dice for being attacked by a model in its rear arc)? A: Free Strikes still take into account the position of the models. Page 8, bottom right paragraph, states that the Free Strike happens before the model is moved. As turning counts as movement (even though it is free), this means that the model must take the Free Strike with whatever penalties would normally apply, plus the additional -1D for being a Free Strike. Yes, it’s harsh, but that’s what you get for running away! Q: Can you move from one square that is adjacent to an enemy model to another square that is also adjacent? In reading the rules, it looks like you can, since your movement ends when you enter an adjacent square to an enemy model. It also appears that it wouldn’t provoke a Free Strike, since that’s only provoked when you move away from an opponent. A: No. You may never (future Special Rules aside) move from one square that is adjacent to an enemy to another that is also adjacent to the same or any other enemy model. If you are adjacent to the enemy you have the option to Break Off, or turn on the spot. Breaking off will trigger a Free Strike, but turning will not. This is implied rather than explicit in the current rules, and if I get a chance to edit them on future reprints I will make it clearer. To keep things tidy, comments and questions will be deleted from this page once they have been actioned. First off, let me just say “thank you” for doing this, and thank you for giving the fans access to you to keep up with the rules and gain insight. You’ve made two really great games in the DKH series so far, and I look forward to more. I had a blast demoing them both and Gen Con, and they really showed well and got people’s attention. I grant that all games are abstraction, but why did you choose to model combat in this particular way? What was the problem that was introduced by allowing models to sidestep or move to an adjacent square? Why did you consider it valuable to be able to change the angle from which an attack comes to gain an advantage, but not to be able to step to a more advantageous square? The above questions were tidied up versions of ones asked and answered on the Mantic forum. I can’t recall who posted which, I’m afraid, so they may well have been yours. The answer is really to do with tactical options. I wanted there to be a small rules “footprint” to give a big set of interesting tactical options. Facing is an easy rule to explain, and the way it is done in DKH deliberately allows you to put your back against a wall and therefore have no rear arc exposed. However, by putting yourself in this position you leave yourself open to being pinned there, ie you have a clear tactical choice of whether to take the risk or not. If you have Shield Bash then you won’t worry about this so much; if you don’t then you need to consider your positioning more carefully. Incidentally, <emShield Bash is a very important positional tool and one that people tend to pick up on only slowly. This is good because it allows a gradual learning curve for the depth of tactical options. DKH combat is highly positional and not terribly fluid in an individual sense (it’s much more fluid when you look at the game overall). Partly this is a side effect of the size of board available, partly that I chose to take a more gamey and less simulation based approach to melee. This seemed appropriate given the brevity of rules I wanted and the type of game I was aiming for. In terms of close combat reality, I think that you can’t really use a boxing match as a reference point. In a boxing match, the ropes bounce and give. Also, a boxing match is hugely artificial – they aren’t allowed or trying (supposedly) to kill each other. Boxers that escape from this position are often allowed to do so because they have simply turtled up against the ropes and are not terribly vulnerable to the attacks permitted. Their attacker lets them go so they open up their defence once more – all to do with the artificiality of the style of combat. In reality, weapons based melee combat is far more mobile that shown in DKH (and almost every other game). However, this would need a load more rules and is a different game entirely. I’ve written such systems and they take up a lot of space. They also become the whole game. It’s not just this particular detail, once you start to model intricacies you want them all: feints, initiative, dodging, reverse strikes, grappling, throws, punches, attacks with hilts, broken weapons, trips, headbuts, dropped or grabbed weapons, etc, etc , etc. That makes sense. In part, it’s there to counter the utility of putting your back to a wall (which is hugely useful) and to keep it for a future trick. Thanks for the insight! I think two of the answers contradict each other. One says turning will trigger a free strike and the other says it won’t. We had they “can you move in combat.. Just one square” come up last night and decided the rules allowed it which seemed sensible to represent fighting your way through. We also forgot the -1 for free strikes! It’s Breaking Off (ie moving to a different square) that triggers the Free Strike. If you have already declared that you are Breaking Off then you get thumped before you move anywhere (including turning) because you’re leaving. If you just turn then you are till adjacent and so have not Broken Off (so you don’t trigger a Free Strike). Free Strikes are, after all, just a mechanical way to deal with the fact that we have broken reality into artificial slices called turns. I tried the moving around in adjacent squares rule during playtesting, and decided to leave it for a particular type of model as an additional skill. On the whole fights do not last long enough for it to be as useful as you might imagine, and it is cleaner if you just say no. Note that I don’t mean mechanically cleaner here, more tactically. – Can a Hidden counter attack? Common sense says no, but rules don’t specify. Here I’m just beign nitpicky, because I know some players will try that. I’d suggest removing the “fighting” part in this sentence: “…the Dwarf player can spend an Action on a Hidden counter to reveal the Dwarfs it represents instead of moving and fighting with it”. It is in page 13. – Can a Hidden/Dummy counter share the same square with a Pile of Bones or a Pit of Souls? The rules say (page 12, last para, first line) that “A Hidden/Dummy counter is moved like a normal model…”. This means that it can move onto squares a normal model can move onto, so yes it can stand on a Pile of Bones, but no it can’t stand on a Pit of souls – just like any other Dwarf model. I’ve got a Son of Stone question too. Do Undead models next to a hidden counter being revealed get a free strike if any Dwarfs are placed? Seems only fair since that’s how piles of bones work. Also, any tips for winning Scenario 4 with the Undead? Fantastic game, by the way. Do they get a Free Strike? No they don’t. Whilst the situation is similar in mechanical terms, what is “really” happening is quite different. In the case of the Skeleton being resurrected, the Dwarf is standing there when the piles of bones at his feet begin to move about and then gradually start to reform into a whole. It can’t do anything much while it’s half made, and I envisioned this taking several seconds – plenty of time for the Dwarf (or anyone else) seeing it to react in the obvious way, which was to attack before eit did the same. In the situation of the Dwarfs “decloaking” and being revealed, they are there all the time, just trying to inconspicuous. They can’t be surprised in the same way, and in the case of then choosing to reveal themselves I think there is more of an argument for them being able to get a Free Strike against their foes in the form of an ambush, if you will. Scenario 4. This is always on a knife edge as the Dwarfs don’t have to go far. You have to keep things locked down all the time. Use your Hounds and Skeletons to block Dwarf movement and escape routes, and your Revenants to kill (if you can). First priority is always to block the route of the moving Dwarfs as solidly as possible. Moving models to come at them from behind is nice, but secondary. It’s a funny scenario because the tactics for the two sides are so different. The undead have a steady grind to win; the Dwarfs are always looking for that gap to dash through. Oh, and note the errata at the top (setting up the Hound 1 square to the left). Thanks Jake! That makes a lot of sense. I’ve just got DKH-GM this week and I really like it. I have a couple of questions about firing though. The rules state about line of sight that you trace from centre to centre of target and firing squares and if the line passes through any occupied square or out of the board area at all the shot is not allowed. a) do you count the target square as one the shot “travels over”? My confusion comes from the diagram pg10 – the central “Y” shot “travels over” 4 squares (5 squares if we count the target one), but the target is only 4 movement squares away (and so “travels over” 3 movement squares). As you lose 1 dice per square the only way the example shot is possible is with the very final scenario above (4 dice – 3 squares = 1 dice for shooting). The line is, in effect, infinitely thin, as you suggest. This is a relatively common method of determining line of sight on gridded boards (for example, DUST Tactics uses something very similar) and I thought there was no need to reinvent that particular wheel. As the rules stand, at this extremity of allowed line of sight, you can see half of the target square – any less and you have no clear shot. Losing dice for range is 1 per tile, not per square (top left paragraph on page 11). This makes it far less punitive, and also allows for some interesting choices of positioning. As normal with measuring distances on boards, you do not count the square the shooting model is standing on, but you do count the one the target is on. Awesome, thanks for that Jake. I had the same confusion first read through on treasure tokens and the difference between square and tile. ohmygod. No wonder I thought shooting was way underpowered. G’day, I have a question about the shield bash ability. According to the rules (don’t have them in front of me, so please correct me if I’m mis-remembering), the model that is the recipient of the bash is “pushed” by the basher into any one of its available rear-arc squares. This rule makes perfect sense when the models in question are facing each other. But what happens if my dwarf/orc is directly facing the back of a skeleton/elf? According to the letter of the rules, said model should end up… directly to my model’s left/right? Is this correct? It just seems a little weird – the point of a shield bash is (generally) to get an annoying model out of the way, but if you’re facing it from behind, you’ll end up putting your target in a potentially more dangerous position (at least with respect to the attacking model, anyway). Now I realise that realistically, I’d probably just want to attack and get the rear-arc penalty applied to the defender, but could you please humour me, just for arguments’ sake? I’ve had this discussion before, and it’s a good one. The rules as they stand do indeed work as you say. if I walk up behind someone I can shield bash them so they move next to me. I knew this when I wrote the rule, but left it as it stands for a couple of reasons. Firstly, in order to define how it works so that you only push people away, you have to define away exactly, both orthogonally and diagonally. This would require at least one more diagram and probably take up half a page or so. I’m sure you can think of better uses for half a page (like half a new scenario). Secondly, although I’ve played and watched more than a couple of games now, I’ve never see anyone actually do it. It’s been raised once or twice: “look what would happen if I shield bashed him now”, but invariably the player goes “how amusing. I think I’ll kill him” and crumps the unfortunate warrior from behind. Rear attacks are just too useful. I can envisage situations where this odd shield bash would be the thing to do, but they clearly don’t happen much. I’ve never thought it worth doing myself. Having said that, I don’t think it’s actually an entirely implausible combat move. All you’d have to do is use your shield to hook over their shoulder and drag them left or right, out of your way. Or, more likely, out of your friend’s way. As they’re looking the other way it’d be tricky, but possible. So the answer is that I can see it being a real move in a real fight and it’s never used anyway, so why waste the space stopping people trying? There, that didn’t take half a page, did it? Just kidding – many thanks for the answer. I had a similar question (skeleton with back to the wall bashed from the side) and now I know the official ruling. I must say I’m very disappointed – not only I consider this rule bad from both gameplay and climatic point of view, I’m really surprised that the reason is saving half a page in the manual… Especially that I think that more logical ruling could be put in two sentences (pardon my rough English): “Dwarf can use a shield bash manoeuvre to push adjacent enemy model by one square. As a result of this movement both models can be no longer adjacent.”. Of course all other things (square must be empty, no pushing off the board, no change in facing etc.) would stay. What do you think (I can’t see where it wouldn’t work but I’m sure you thought it through much better)? BTW: I think I got it right but I’d like to be sure: shield bash succeeds automatically, there is not need for attack roll and at least one success? Can Baleful Gaze be used to give an additional action to an already activated figure? Or is that action exactly as if you’d drawn an extra 1 tile? The former. If you check page 11, bottom right hand paragraph it should be clear. Let me know if it isn’t. Thanks! I wasn’t sure whether the “additional” applied to a model or to the turn, but I suppose if it was to the turn (which it isn’t) then it’d be almost always inferior to Meditate. Do It Now! gives a single model a move and fight action. This can be played on a model that has already acted in that turn or one that did nothing. Perhaps it’s simplest to think of step 5 of the turn sequence (using Baleful Gaze) wiping the slate clean and ignoring everything that happened so far that turn, in terms of movement and action restrictions. When fighting “for each pair of dice where the attacker has rolled higher than the defender” I assume this does not include equal to, but in the example on page six the dwarf roles a 1 and the note says dwarf wins, surly this is a drawn result not a win (defender assumed to have roled 1) as above the 2 wins but doesn’t beat the armour value of 2. I know this is very picky but I play games with alot of beards who would reinterpret this to there advantage. Hey Mark, picky is fine. You are correct, it should say it’s a draw (and therefore a defender win) when the Dwarf rolls a 1, not a Dwarf win. of course, it doesn’t actually matter in this case, but it is worth correcting because it may confuse the issue elsewhere. Interestingly, looking at the equivalent example in Green Menace I’ve changed it so it’s not a problem. Good point though. I’ll add it to the FAQ above when I get a moment. -Does an activated model have to stop adjacent to an enemy if its in his rear only? -Does an opponent get an Free Strike for Breaking Off even when it its rear? -Does an additional modell, which is not facing an an enemy also count for the outnumbering penalty? If all above questions are answered with yes, I asume that would mean facing is only taken into account for -1 penalty when attacked in the rear. Many thanks in advance for answers to my questions! Yes, you stop when you move adjacent to an enemy model. See the diagrams on page 5. Remember that this need not be because the model feels threatened – it could be also because he sees a good opportunity to attack! The phrase in the Breaking off rules that applies here is “his opponent gets a Free Strike against the moving model with each of his own models that can attack it”. Also, in the section on Fighting on page 6 it says A model can never attack an enemy in its rear facing.So, as you cannot normally attack to your rear you cannot make a Free Strike to your rear either. You only count for outnumbering if you could attack the enemy in question. Although it is not as explicit as it could be, this is worked out as part of the fight splitting sequence. 1. do you just need a follow on action to do play more follow on actions? 2. how far can ya move if you just play the token on a model that did not move? 3. can you use a shooting using a follow on token? 1) I don’t understand the question. Could you rephrase it please? 2) A move action from a Follow On counter is the same distance as a normal move. It does not matter whether the model moved already or not. 3) Yes, a Follow On counter can be used to Shoot. Awesome game, love it. Though I just did get my bum handed to me. Anyhow I have a quick question re: the Follow On actions. In the rules it states they can be used on ONE model. Is this correct ? If you have 2 Follow On counters can you use them on 2 different models, or do both have to be used on the same model. You can use each Follow On counter on a different model if you like, or repeatedly on the same one or whatever combination you like. The phrase “spend as many as you like on one model” refers to the fact that you can normally only spend one per turn on a single model, and this breaks that rule. Awesome, thanks for the quick reply. That clears up about the only issue that we’ve had with the rules. Loving the game! Been playing each scenario in GM a few times with the wife before moving onto the the next :). Just wondering about tactics for Scenario 8 (Try Your Luck) – every time we play it, it basically descends into one mass combat around the bottle-neck in the board and even though the elves often grab some treasure, it really comes down to who kills the other team as you can’t get passed with way otherwise. First off, I wanted to say a big thank you for this game – simple, quick and easy to pick up but with a staggering amount of tactical flexibilty. I’m new to Matic’s games (about 6 weeks since I found out about them…), and I enjoyed Dead Rising so much that after playing the first couple of scenarios I bought Green Menace immediately. I was finding, after several playthroughs, that Scenario 1 is heavily weighted in favour of the Undead, with them absolutely thrashing the Dwarfs every time, but after having the opportunity to speak to Chris Palmer yesterday at the demonstration of Dreadball in Wiltshire (another cracking game, by the way), he has assured me that, while difficult, it is possibly for the Dwarfs to win. I do still have one dumb question born of logic and real life (which I admit, by necessity, has to be at least partially ignored), and that is about the turning to face an enemy in your rear arc: does it cost an action? In real life it’s automatic if you know they are there – I’m a live roleplayer, so it’s experience telling me this – and if you don’t know they are there, you wouldn’t be (perception-wise) outnumbered as you’d be ignoring them completely…but as far as I can tell in the rules any and all movement requires an action. In answer to your question, yes a turn costs movement. It is movement, so must be part of a movement action. The nuances of “real” combat are quite tricky to get into a game and involve breaking a number of gaming assumptions and standards. Not impossible (I’m moving much more that way with a skirmish game I’m developing called Eternal Battle), but often a bit too complex for this level of game. Mostly, it’s not playing the rules wrongly that is causing this, it’s tactical considerations. The scenarios are designed to require different (but related) tactics. Some you need to move quickly; in others you should be slow and cautious. Finding out which is appropriate each time is part of the fun. Do you rush a lone Dwarf forwards, advance cautiously, send up 2 and leave a rear guard? I’ve played a lot of different people from many groups and I still sometimes come across people using tactics I haven’t thought of before. There are quite a few subtleties to be unearthed here. To try to be a bit more helpful, the single biggest thing that Dwarf players tend to miss is the usefulness of the shield bash. Also, have you tried playing both sides? It’s often useful to see how things look from the other force’s POV. When resolving fights with say one Dwarf vs two skeletons, do both skeletons roll their dice to defend when the dwarf makes an attack? And if I beat all their dice can I bone two skeletons with one blow? When resolving a free strike from multiple attackers, or the Kill Him! effect of Baleful Gaze, do you roll all the attacking model’s dice at once against the single target?